Digital Image Processing Techniques is a state-of-the-art review of digital image processing techniques, with emphasis on the processing approaches and their associated algorithms. A canonical set of image processing problems that represent the class of functions typically required in most image processing applications is presented. Each chapter broadly addresses the problem being considered; the best techniques for this particular problem and how they work; their strengths and limitations; and how the techniques are actually implemented as well as their computational aspects. 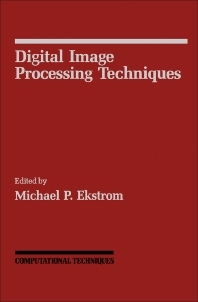 Comprised of eight chapters, this volume begins with a discussion on processing techniques associated with the following tasks: image enhancement, restoration, detection and estimation, reconstruction, and analysis, along with image data compression and image spectral estimation. The second section describes hardware and software systems for digital image processing. Aspects of commercially available systems that combine both processing and display functions are considered, as are future prospects for their technological and architectural evolution. The specifics of system design trade-offs are explicitly presented in detail. This book will be of interest to students, practitioners, and researchers in various disciplines including digital signal processing, computer science, statistical communications theory, control systems, and applied physics.